There have been two confirmed changes to next season's Division Two fixtures. As expected Reading's home game against Wrexham will be moved forward a day so that it no longer clashes with the Reading Festival weekend. The match will now become an evening fixture at the Madejski Stadium, kicking off at 7:45pm on Tuesday the 28th of August. The other fixture change involves the Royals trip to Brighton - which will be bad news for Reading fans planning a weekend of it. Brighton aren't allowed to play any home games on Saturday during December, which means the game will be moved to the Friday night on the 14th of December. View the fixture list for a full view of all next seasons matches - changes to fixture dates are shown in bold on the fixture list. Saturday is the last day existing season ticket holders can renew their season tickets and save twenty quid in doing so. Adult season tickets for the North and East stands are 240 pounds for renewals up until Saturday, and then 260 pounds for all other applications from Monday onwards. With the East Stand reserved seating next season a large number of season ticket holders will be making the move to the unreserved North Stand. The North East corner of the North Stand looks set to become a popular area. An additional benefit for season ticket holders next season is free entry to Shooters bar in the East Stand. The club are reporting that all season ticket sales are up on last season despite changes to seating policy and the price increase. The ticket office is open until 4pm on Saturday. As reported on this site last week, Darren Caskey is set to agree his transfer to Second Division Notts County today. County have apparantly offered Caskey the best deal, despite plenty of interest in the player from Mark McGhee's first division Millwall. Caskey looks set to sign a four year contract at the club and could be in line for a big pay increase too. Reading play Notts County at Meadow Lane on the 20th of October. Meanwhile out-of-contract Scott Howie could sign for Queens Park Rangers this week after discussions with the club. Howie is keen on first team football after spending the whole season on the bench at Reading after losing his place to Phil Whitehead. Howie originally signed for the Royals for �30,000 from Motherwell in March 1998 and made over 100 starts for the Royals. Neil Smith is also in discussions with Brighton and Hove Albion and Kidderminster about a possible move. We are now in a position to provide Hob Nob Anyone? readers with the full 2001/2002 fixture list - thanks to Philpott Black who have stepped forward to pay the license fee on behalf of this site. To legally display fixtures on a website a fee of 250 pounds must be paid for the appropriate license - and this was something we couldn't afford as this site is non-profit making. Any income this site receives is used for hosting and domain name costs - with additional money being put directly back into Reading Football Club. The purpose of this site is to continually support Reading Football Club, as we've been doing non-stop since 1994. Click on the link below to view the full fixture list for next season. Other names linked with the Royals are Wigan winger Peter Beagrie, 35, and Bristol City midfielder Paul Mortimer, 33. Both players are available on free transfers and are likely to be invited for trials, although due to both players' ages and injury histories it would be a surprise if either were given deals. Meanwhile Academy defender Adam Lockwood is reportedly being chased by conference side Forest Green Rovers, Southend and Kidderminster. Lockwood spent a successful period on loan at Forest Green last season and has been told he is surplus to requirements at Reading. Kidderminster have also expressed an interest in Neil Smith, also out of favour at the Madejski. Out-of-contract Darren Caskey looks set to continue his career in Division Two for now with a move to Notts County. Caskey's contract was not renewed because of excessive wage demands at Reading - but according to his agent Notts County are prepared to meet his required salary. Assuming the deal goes ahead then Caskey is expected to sign within the next week. Caskey would meet up with his fellow team mates again on October the 20th when Reading visit Meadow Lane, and would return to the Madejski Stadium with Notts County on February the 9th 2002. Meanwhile it is being reported that John Fearn, who was deputy physio at West Ham, is set to replace Paul Turner who vacated the physio position at Reading recently. Reading will kick off the new season in Division Two on August 11th with a trip to Blackpool, who were promoted last season after play-off victory. The first home game will be the following Saturday, the 18th of August, when newly relegated Huddersfield Town visit the Madejski Stadium. With Huddersfield tipped to return straight to Division One the match will be an early season test of Reading's automatic promotion chances. Swindon Town will visit Reading on 13 October, with the return leg on 16 February. The Royals will travel to meet the fake hoops, QPR, for the third league fixture of the season. Just like two seasons ago, the boxing day trip involves a journey to Cardiff. Reading's run into the season features some very tricky away fixtures - Reading's final game of the season, that could determine promotion, will be a trip down the M4 to Brentford on 20 April. But before that Reading will travel to Tranmere Rovers on 6 April and face Peterborough United at home on 13 April. Unfortunately we are unable to bring you the fixture list in full due to licensing regulations on the display of the fixture list. Last season we attempted to pay the 75 pounds fee, but our application was refused by the football league without good reason. We have now received permission from Reading Football Club to apply for a license for this season. However, even with the club's permission, we are still unable to legally display the fixtures unless we pay a ridiculous license fee of 350 pounds. This kind of money isn't available to us unless some sponsorship can be found. Hob Nob Anyone? is a non-profit making website and any proceeds are put straight back into the club. If your company would be interested in sponsoring the fixtures this season please contact us for details. Reading manager Alan Pardew is reported to have no money to spend on incoming players over the summer. Any signings are expected to be on free transfers as Pardew scouts the market for players coming to the end of their existing contracts. The only way Pardew would be allowed money to spend on players currently under contract would be if any players are sold for big money. Although there has been plenty of rumoured interest in Cureton and Butler, neither player is likely to move on even though they would attract huge transfer fees. Portsmouth are rumoured to be interested in Cureton, but are unlikely to put in an offer that would be acceptable to Reading Football Club. Pardew is on the look out to add at least another signing to Andy Hughes and Adrian Whitbread who are expected to complete their signings next week on free transfers. On the list of rumoured players interesting Pardew is out of contract Huddersfield forward Benjamin Thornley. Twenty-six year old Thornley was a regular for Huddersfield last season after signing from Manchester United for 175,000 pounds in the summer of 1998. Thornley made six starts for United in the league and cups after signing as a trainee in 1993. The club are reporting that season tickets are selling well - at a great rate than for the last season - with over 2,300 tickets already sold. Last year we sold around 4,000 season tickets in total, and the club are predicting that we should pass this mark this time around. Existing season ticket holders have until 30th June to renew their tickets are the discounted rate before all sales revert to the full rate of 260 pounds for the North, East and Lower West stands. All adult season tickets are twenty pounds more expensive this season. Admission for non-season ticket holders will go up to 15 pounds on the day for adults in all stands except the West Upper stand - and 13 pounds if bought before the day of the game. This is an increase of a pound per ticket - not bad as it's the first increase in ticket prices since moving to the Madejski Stadium. However, fans are left with plenty to complain about with the club refusing to back down on their policy of reserved seating in the East Stand next season. A number of East Stand ticket holders will be renewing their tickets in the North Stand for next season to take advantage of unreserved seating. All published surveys clearly show that fans, season ticket holders or not, wanted the East Stand to remain unreserved seating. However, the club are mysteriously claiming the opposite stating "In our recent poll, the majority of season ticket holders voted for reserved seating, and we have far more season ticket holders in the East Stand than any other.". How the club arrived at this conclusion, or this set of results, is certainly up for debate. This time two years ago the club were congratulating themselves on their decision to keep the East Stand unreserved: "The Club reports that season ticket sales are particularly strong in the popular East Stand, which supports the recent decision to maintain the policy of unreserved seating in the East Stand for most matches.". How time changes things despite the Royals remaining in Division Two for one more season. First Division Rotherham, who beat Reading in the race for the second automatic promotion spot two months ago, are said to be interested in signing up Jimmy McIntyre who is being released by the Royals this summer. Jimmy McIntyre is not being offered a new contract at Reading despite playing some of his best football since signing in March 1998. McIntyre might well jump at the chance to move up a division with the prospect of a regular first team place. Meanwhile Andy Gurney is expected to complete a move to Swindon Town when his contract expires at the end of this month. Gurney will move on a free transfer after signing for 100,000 in January 1999 from Torquay United. Gurney made over seventy starts for the Royals, scoring three league goals in the process. The Royals will face Luton Town in the first round of next season's Worthington Cup competition after the draw was completed this morning. Luton, relegated to the third division after the end of last season, will visit the Madejski Stadium on Tuesday 21st August, for a 7:45pm kick-off. Unlike previous season's the fixture will not be played over two legs. We confidently predict a Reading victory as we progress to face Peterborough United in round two. Adrian Whitbread heads a list of 3 new signings Reading FC are believed to be unveiling on July 1. Whitbread, who played 19 games on loan for Royals at the end of last season, will put pen to paper on a two year contract at the end of the month when his Portsmouth contract expires. The second signing is almost certain to be Notts County midfielder Andy Hughes, whose fee will be set by a tribunal as he is under 24. Pardew has been chasing Hughes for several months now and may intend to give him the left midfield role vacated by Jim McIntyre. The third signing is as yet unknown, but will not be Peterborough's Jason Lee, who turned down a possible move to the Madejski last week. Few Royals fans will be losing sleep over that one. Reading outcast Darren Caskey looks set to join Mark McGhee's Millwall in Division 1 next season after the player met with the London club's representatives this week. Caskey, also being chased by Bristol City and Wigan, is said to favour a club which would allow him to stay living in the Reading area. Reading FC have today announced a prestigious U21 friendly to take place in August at the Madejski stadium. In preparation for their continued World Cup qualifying campaign, England U21 will take on Holland U21 on Tuesday August 14th. Ticket information is not yet available. Howard Wilkinson's team enjoyed a successful visit to the stadium in 1999 when an England side featuring Frank Lampard, Carl Cort and Lee Hendrie thrashed Luxembourg 5-0. Reading Football Club are yet to receive any formal enquiries on the availability of strikers Jamie Cureton and Martin Butler - despite both the players being linked with First Division sides. The players look set to be the subject of rumours throughout the summer after the Royals failed to win promotion. Both players have proved themselves capable of playing in a higher division after scoring 58 goals between them this season. The club may have announced that neither player is for sale - but that could make no difference if a big money offer came in and either player wanted to move on. Speaking earlier this week after being linked with a move to West Bromwich Albion, Jamie Cureton said he'd like to link back up with ex-Bristol Rovers striker Jason Roberts who is now at Albion. Cureton stated, "It would be good to play alongside Jason again and, if I moved, I'd like it to be to a club where I know some of the people already. When Albion came in for Jason last season, it was rumoured at Rovers they wanted both of us.". Mark McGhee, at Millwall, is said to be interested in both Martin Butler and out-of-contract Darren Caskey as he looks to build a stronger side after promotion to Division One. Both Cureton and Butler look likely to stay put at Reading and have no plans to move on at present - but it's going to be a long summer. First Division Millwall are rumoured to be interested in Martin Butler, after confirmation that Neil Harris has testicular cancer. Harris, the Millwall striker, has scored over 70 goals for the Lions after signing from Cambridge City in 1998, but now looks set to spend the long-term sidelined. Millwall could be left with the unfortunate task of finding a replacement for next season - and Martin Butler could be top of the shopping list. Millwall manager Mark McGhee is said to be keen on getting Butler's signature - and will be given a big budget to spend as the side look to build on last season's championship win. However, any offer for Butler would need to be well in excess of a million pounds after the player signed for 750,000 in February 2000. If Butler was to leave it would probably be a record signing of a Reading player - but the club will do all they can to hang on to Butler who will be needed for next season's promotion push. Hob Nob Anyone? pass on their best wishes to Neil Harris. Jimmy McIntyre, voted Reading's most improved player of the season, is said to be gutted after being released this week. McIntyre was keen to stay at Reading and was hoping to be offered a new contract - instead the club have told McIntyre that he has to leave. McIntyre enjoyed his best season at the club this year after signing in March 1998 and was keen to build on his success next season, but now is on the hunt for a new club in England after his family have settled down South. Speaking after his release McIntyre stated he was devestated by the decision and was confused that he should be released after playing some of his best football for the club in the past few months. Meanwhile Sheffield United and Wigan have both denied their interest in out-of-contract Darren Caskey. Caskey's wage demands were considered too high for Reading, and the player is now looking to increase his pay packet with a move to a "bigger club". Reading Football Club have confirmed details of a series of pre-season friendlies as the Royals get ready for another season in Division Two. The pre-season campaign will kick-off on Saturday 14 July when two teams will travel to Aldershot and Maidenhead. Other first team fixtures will see the Royals visit Weymouth, Tiverton, Dorchester and Rushden Diamonds. The only home fixture announced so far will be the game against Premiership Spurs on Wednesday 1 August. The reserves meanwhile will travel to Didcot, Farnborough and Walton for pre-season matches. Our full match report for last Sunday's unfortunate play-off final defeat at the hands of Walsall has now been updated with fans opinion of the match. Apologies for the delay in getting your comments on the game up on the site - the delay was caused by a powercut at our Internet Service Provider which meant we were unable to retrieve any e-mails sent in. Everything is now up and running fine now. If you sent a report or an opinion in and it doesn't appear on the report please re-send as it's possible we never received your e-mail. Thank you! Of course, if you'd like to comment on the game now then please send in your opinion. Meanwhile, we'll be putting together an article on the reserved seating issue. If you have an opinion on the East Stand becoming reserved next season against the wishes of the majority of fans then just let us know. Striker Jimmy McIntyre has been added to the list of players set to leave Reading Football Club this summer. McIntyre will not be having his contract renewed after over three years at the club after signing from Kilmarnock for �440,000 in March 1998. Despite being a regular player in Reading's line-up this season, the management have decided to let McIntyre go with Nicky Forster back to full fitness. McIntyre, who scored 16 goals for the Royals, enjoyed a much improved season this year - so much so he was voted most improved player of the season in the end of season awards on this site. McIntyre has proved himself to be a popular and useful player in the squad - and the fans will be disappointed to see him leave at this stage in his career. McIntyre joins Caskey, Hodges, Gurney, Haddow, Smith and Howie on the list of players who must now find a new club during the summer months. Scott Howie is another shock departure who lost his place to Phil Whitehead this season. Whitehead hasn't put a foot or glove wrong - leaving Howie with no first team opportunities. Howie moves on to progress his career, leaving Reading on the search for a new reserve goalkeeper. Darren Caskey, Andy Gurney and Lee Hodges are all expected to leave the club during the summer. Darren Caskey, always the centre of rumours of moves to higher division clubs, looks sets to at last make one of the rumours come true during the coming months. Caskey, who was left out during Sunday's 2-3 play-off final defeat, is the centre of mixed opinions of the fans - but it would be a major blow if he was allowed to leave on a free transfer. The player has been in negotiations for many months but failed to agree a contract to keep him at Reading Football Club. Clubs rumoured to be interested in Caskey include a slightly different version of the usual list - Wolves, Nottingham Forest, and Preston North End. Caskey signed for Reading in February 1996 for a club record �700,000 and has gone on to make well over 200 starts for the Royals, scoring 45 goals in the league and cups. Meanwhile Andy Gurney and Lee Hodges will not be having their contracts renewed in the summer. Hodges signed for �250,000 in 1997 and will leave on a free, while Andy Gurney signed for the Royals in January 1999 from Torquay for �100,000. Gurney became a first team regular for the Royals after signing, but lost his usual starting place in the side after the start of the year with Murty and Robinson being picked ahead of him. Reading's season came to a hugely depressing end yesterday with an extra time defeat to Walsall in the play-off final at the Millennium Stadium. A crowd of over 50,000 fans - mostly from Reading - saw Reading twice take the lead and look set for promotion with eleven minutes of extra time remaining. The game was far from finished however, and two goals in the same minute gave Walsall a 2-3 victory and left Reading to contemplate another season in Division Two. Earlier in the game Reading had followed up a bright start by taking a 1-0 lead into half time thanks to a volley from Jamie Cureton on the half hour. Walsall came out determined in the second half and looked the better side after pulling level just after the break. As extra time started the Royals looked like they'd done enough to win promotion with Butler making it 2-1, but a cruel second half of extra time saw joy turn to misery as Walsall claimed victory. The entire Reading team never stopped running - but the effort wasn't enough to overturn a strong Walsall side. It's going to take a very very long time to come to terms with this defeat after such a massive build up to the game. To lose out on automatic promotion was bad enough but to lose in such dramatic style in the play-off final is very hard to take. The build up is nearly all over - and the play-off final between Reading and Walsall is just a matter of hours away as we type this. Not long from now the M4 will become a sea of blue and white as the Royals close in on Cardiff. The team are already there and preparing for the climax to the season. Hob Nob Anyone? would like to wish the team the best of luck as the final push for promotion takes place. Naturally they'll be no updates on this site on Sunday with all of us in Cardiff for the game - and then getting very drunk - either to celebrate, or think of what might have been, in the evening. It's a game that Reading can win, and have to win, but Walsall are desperate for a place in Division One just as much as we are. It's going to be tough, but it should be an amazing day out as long as the unthinkable doesn't happen. A Reading victory will bring about one of the most fantastic days in the history of Reading Football Club - and one we'll never forget as close to 35,000 Reading fans cheer the Royals on in the Millennium Stadium. If you're reading this on Sunday, or early Monday, then please check back from Monday onwards for full coverage of the game - in the meantime please check out the discussion boards for details of what went on in the final and to add your opinion. Whatever the result please get typing and send in your report or opinion of the match. All appropriate submissions will appear on the match report of the game. If you fancy writing a full report of the game then we're pleased to announce that the authors of the two best match reports will win a five pound voucher each for the megastore. Send opinion to: opinion@royals.cx, or alternatively send your full report to reports@royals.cx. Not long to go now - COME ON YOUR ROYALS! The club have announced today that the East Stand will be made reserved seating from next season - despite the wishes of fans to keep the stand unreserved. Earlier this year 71.7% of fans voted to keep the East Stand unreserved - a much smaller percentage of fans voted to keep the North Stand unreserved. With attendances on the increase the club clearly felt the need to make another stand reserved in addition to the West Stand - unfortunately they've gone with the minority opinion of the fans and picked the wrong stand. Promotion to the First Division will see the club justify their decision with increased attendances. Failure to gain promotion will see a massive number of East Stand regulars very very frustrated with a decision that should clearly have been left to next week. Meanwhile season ticket prices have been increased by twenty pounds - which means existing season ticket holders will have to pay 240 pounds for their ticket. New season ticket holders will have to pay 260 pounds. Season ticket holders in the East Stand will now have to think carefully about renewing their ticket or making the switch to the North Stand for unreserved seating. Prices for concessions are 140 pounds for renewals or 150 pounds for new applications. The Upper West stand, which remains reserved seating, will be 340 pounds for renewals or 360 for new tickets. Existing season ticket holders have until the end of June to claim their current seat. If Reading win promotion to the First Division on Sunday, with a victory in the play-off final at Cardiff, the team will take to the streets in an open top bus to celebrate. The procession would take place on Tuesday with the bus driving from the Madejski Stadium to the town hall in the centre of Reading. Thousands of fans would be expected to gather in town hall square to celebrate - but there are no formal plans yet with Sunday's game still a few days away. Walsall will no doubt be planning their own celebration as they prepare to do battle with the Royals in the Millennium Stadium. The minutes continue to tick away until kick-off - with every Reading fan wishing time away until Sunday 3pm. If you're still to get your ticket for the game, then the good news is the ticket office will be open during Friday to sell the remainder of Reading's ticket allocation. No tickets will be on sale on Saturday - so make sure you pop down the ticket office during Friday morning to snap up your tickets before it's too late. Come on you Royals! Thanks to everyone who got their SAE's in the post yesterday for their free balloons and stickers - around seventy packages were sent out this morning! If you didn't get round to it then please don't post anything out today as we won't be able to get the stuff back to you in time for Sunday. If you are travelling to Cardiff on the road then remember to decorate your vehicle in blue and white! Although, however you do it you'll have to go some way to beating Dave Clarke from Tilehurst. 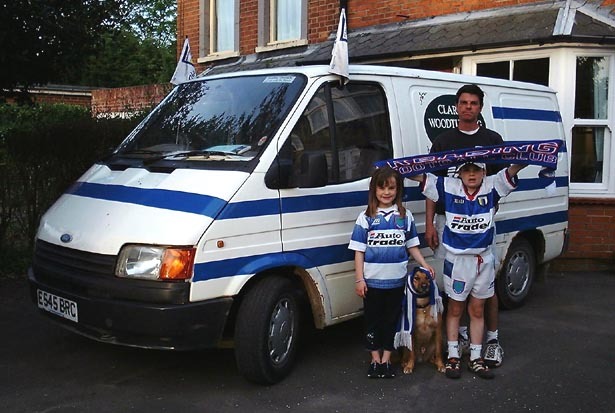 Halfway through the season Dave promised his kids that if Reading went up or reached the playoff final the company van would be painted with blue hoops. Dave and his van are pictured with Annie and Louis and Woody the dog If you see Dave on the way to Cardiff make sure you give him a toot! Meanwhile, Reading Football Supporters' Club are reporting that all ten of their coaches are now fully booked and no more bookings are being taken. Approximately 7,000 tickets are still available out of Reading's allocation of 40,000 for Sunday's match - if you haven't got your ticket then pop into the ticket office and buy one today. It's a game no one should miss. Please make sure it gets today's post or we won't be able to get the stuff back to you in time! Any remaining balloons will be dished out outside the stadium on Sunday. Tickets continue on sale at the Madejski Stadium today for Sunday's play-off final match with Walsall at the Millennium Stadium in Cardiff. Reading have now sold over 30,000 tickets for the fixture - with less than 10,000 now remaining to be sold. It seems certain that Reading's allocation of 40,000 will sell out well before the day of the game. With 40,000 Reading fans making the journey to the match fans are being advised not to travel by car to the game. A massive number of coaches are being laid on - as well as extra train services. Anyone travelling by coach will find themselves on a more direct route to the ground, and coaches will be parked within walking distance of the ground. Cars will be directed away from the ground and passengers will need to use the park and ride facilities that are signposted from the M4. For full travel and ticket information please see the play-off final match preview. Royals' chances of fielding a fully fit squad for Sunday's big match have been boosted by the news that both Darren Caskey and Graeme Murty look likely to recover from injury in time. Caskey limped off with a damaged foot after a tangle with Wigan's Kevin Nicholls last Wednesday, while Murty suffered concussion in a training ground clash of heads with Nicky Forster ten days ago. Both are declaring themselves ready, however. Caskey said today "The foot is a lot, lot better. I�m not sure if I�ll be able to train today. Hopefully I can do some jogging, but I�ll be looking to resume full training on Wednesday. I�m pretty positive I will be OK for next Sunday. It�s still sore but it�s getting better with every day." Murty said: "I�m hopeful I will be OK for Sunday. I will see Paul Turner today and I�ve got to wait for a doctor to certify I�m OK, but I do feel much better", before adding �Fozzy has apologised to me and I forgave him when he scored the winner." Play-Off Final Fever Takes Hold! Play-off final tickets are selling fast already after going on sale to season ticket holders only this morning. The ticket office opened early, at 8am, to start dealing with the queues of fans already waiting to claim their tickets. Some fans apparantly turned up as early as 2am to get at the front of the queue! Play-off final fever has truly taken hold of Reading. The Royals have been allocated 40,000 tickets for the final - approximately 15,000 more than Walsall - and we're expected to sell out the full allocation in a matter of days. Tickets go on general sale to personal callers at the Stadium tomorrow morning - when fans will be able to buy up to nine tickets each. Meanwhile, the Royals have been named as favourites for victory in the final at Cardiff. Walsall are evens for victory, but the Royals have been given odds of 8/11. For full ticket and travel details please see the full play-off final preview. Family Area (Corner of Stadium): Adults �15.00, Juniors �11.00. YES! - We are on our way to Cardiff! In the most amazing evening ever seen at the Madejski Stadium, in front of the ground's record crowd of 22,034, the mighty Royals have progressed to the play-off final. The last five minutes of the match were just fantastic - it doesn't get any better. It's impossible to calm down after that and I'll be wearing this smile all week. Reading looked down and out after a first half goal from a free kick just outside the Reading box. Reading went full out on the attack in the second half and after several missed chances it looked like it just wasn't going to be our night. But then Forster came off the bench with ten minutes to go. Five minutes later and the depression was sinking in with the Royals going out to a single Wigan goal. A minute after that and it couldn't be any different after a Forster run into the box set up Butler to equalise. The Madejski Stadium erupted like it never had done before. Four minutes later - in the last minute Forster was brought down in the box. A penalty. Cureton's effort was saved, but there was super sub Nicky Forster to stick it home. 2-1 to the Royals - coming back from the dead to qualify for the play-off final. The most incredible five minutes of football I've ever seen that could potentially alter the course of our season. The atmosphere was just amazing - the result was the best - it's a night no Reading fan could ever forget. Reading now go on to face Walsall, who beat Stoke 4-2 tonight, in the play-off final in Cardiff on the 27th of May. WE ARE GOING UP! The club are advising fans to arrive as early as possible for tonight's sold out semi-final second leg match at the Madejski Stadium. With a crowd of 23,000 arriving at the Madejski Stadium and the usual tail end of rush hour traffic on the A33 there promises to be plenty of problems for anyone travelling to the ground by car. To add to the chaos the Compaq car park will be unavailable for match day parking (in use by employees of Compaq!). Car parking at the ground, and the Speedway track, is expected to fill early. To cope with the problems the gates will open at 6pm tonight to allow those who arrive early to get in the ground and soak up some atmosphere before kick-off. Also, extra buses will be running to the stadium from the town centre - there will be two buses running on the number 75 route. Reading must win tonight - so help out by arriving in good voice and make sure you're all coloured up blue and white! Wednesday night's vital play-off second leg match at the Madejski Stadium between Reading and Wigan has now sold out to Reading fans. The sell out means the match will be Reading's biggest ever crowd at the Madejski Stadium with an expected attendance of approximately 23,000 fans. Wigan have sold around the 1,200 mark for their section of the South Stand - meaning the only gaps in the Stadium will be in, and surrounding, Wigan's allocated area. 1,800 seats in the away end have been sold to Reading fans in order to increase the availability to home fans - these all sold out this afternoon. Remember it's blue and white night tomorrow at the Madejski Stadium - so make sure you come all coloured up to give the team a massive boast as they look to progress to the play-off final. Wigan have been deprived of 10 coaches for the trip to Reading this Wednesday due to Liverpool�s involvement in the UEFA cup final in Dortmund on the same night. Wigan were set to bring 20 coach loads due to the fare only being �5 but as the two clubs use the same coach company from the same depot Wigan will have to make do with 10 coaches as Liverpool booked their coaches before Wigan. This will cut the traveling support in half as many people saw the coaches as their only route to the game given the lateness of the match. Wigan are expected to bring in the region of 1,000 fans with approximately 900 tickets sold so far - far less than the 3,500 Reading fans that travelled to Wigan last Sunday. The ticket office have released an extra 1,800 tickets for the South Stand for the play-off second leg match at the Madejski Stadium on Wednesday night. Wigan have been unable to sell out their existing allocation, which means the club have spare tickets for half of the away end which went on sale this morning to home fans. The seperation of the away end means the game will almost certainly be the biggest ever crowd in the Madejski Stadium - with anything up to 22,000 home fans present. Home tickets for the South Stand can be purchased today and tomorrow (if any remain) from the ticket office, and are priced at the usual 12 pounds for adults and 7 pounds for concessions. Following the amazing success of yesterday's orange day at Wigan, fans are urged to go blue and white as the Royals battle for a play-off final place at Cardiff. Get your hands on as many blue and white balloons as you can, wear only blue and white, and get down the Madejski Stadium to cheer the Royals to victory. It's a massive game, that we have to win, and there promises to be a fantastic atmosphere. Reading moved one step closer to the play-off final with a 0-0 draw with Wigan at the JJB Stadium this afternoon in the first leg of the play-off semi-final. A massive Reading away following filled the East Stand in a sea of orange as Reading hung on to take away a valuable draw. The result puts the Royals in the driving seat for Wednesday's second leg at the Madejski Stadium. With away goals meaning nothing the result was fantastic, leaving Reading with home advantage in which to win the tie. The atmosphere was well set before the match with the travelling fans in party mood - and it was the Royals that enjoyed the best of the opening twenty minutes. Wigan got off to the best start, forcing an early save from Whitehead, before Reading twice nearly took the lead. Barry Hunter had an effort well saved, and Phil Parkinson put in a bullet header from a corner that went just over the bar for a corner. However, the rest of the game belonged to Wigan with Reading doing far too much defending. It seemed just a matter of time before Wigan would score, with Whitehead in fine form and Viveash clearing one off the line. After failing to hit the net in the first half Wigan failed to get quite so close in the second half with a series of long range efforts. Reading continued to defend and play for the draw and after a nervous few moments we'd clung on to draw. Frustration for Wigan boiled over into a pitch invasion from the home fans at the final whistle, while Reading's fans stayed in the stands to applaud a result that keeps us well on course for promotion. Congratulations to Martin Butler and Jimmy McIntyre who win the Hob Nob Anyone? End of Season awards for player of the season and most improved player of the season. Both players won by a clear majority - both taking nearly a full half of the vote in the respective categories. Butler won player of the season from Jamie Cureton by over 20% of the vote, with Phil Whitehead fininshing third in the table. Previous player of the seasons Phil Parkinson and Darren Caskey fared very differently, with Parkinson taking a respectable fourth position with nearly 10% of the vote and Caskey failing to win a single vote for player of the season. There are still places available for the RFSC coaches going up to Wigan on Sunday. If you would like to travel by coach then you can book your place either today (Friday) or Saturday morning by calling into the Madejski Stadium. The cost for the journey is 15 pounds, with the coaches due to leave the Madejski Stadium at 8:45am on Sunday and the Mecca Bingo Hall on Station Hill at 9:00am. To book coach travel you will need to be a member of RFSC - however membership (which runs until 30th June) can now be purchased for a discount two pounds instead of the usual five. Membership is available by post or in person at the Stadium. Please see the Supporters' club pages within this site for further details. Meanwhile, there are still tickets available for Sunday's game at Wigan. Tickets are on general sale now to the public and can be purchased in person from the stadium either today or Saturday morning. A single personal caller to the ticket office can now pick up multiple tickets. Reading's request to extend central defender Adrian Whitbread's loan spell at Reading into the play-offs is rumoured to have been rejected by the FA. If Whitbread is unable to play it will be a big disappointment for Alan Pardew who was looking to stick to the central defender partnership of Viveash and Whitbread against Wigan. Whitbread, who has made 19 appearances for the Royals since signing on loan in February, could still sign for Reading during the summer as he looks to move away from Portsmouth. If Whitbread isn't allow to play Barry Hunter, who has been on the bench every match recently, will step into the starting eleven. The upside is Hunter will have plenty to prove with Adrian Williams returning from injury. Wigan are facing a rush to get some of their star names back in time for Sundays massive game at the JJB Stadium. With a traveling army of 4000 + Reading fans going to the game we will be hoping for any luck passed our way ahead of the big clash. It certainly seems that Wigan will be anything but full strength with a casualty list as long as Peter Crouch�s right leg. Although the following are injured it seems likely that some will be back in time for at least the 2nd leg. The club have confirmed that the Royals will be playing in the orange away shirt for the trip to Wigan on Sunday. Fans are urged to leave the players in no doubt about the massive support by going orange for the day as the Royals attempt victory in the first stage of the play-offs. There's still plenty of tickets left for the game at the JJB Stadium with Reading being given a massive allocation. However, tickets are selling fast, so you're recommended to call in at the Stadium in person to secure your seat. If you're making the trip to Wigan make sure you dress in Orange (or stick the Orange shirt on if you have one). Orange balloons are a good idea if you can find some to create a massive Reading atmosphere! Our reporters will, of course, be at the game as usual and a full review of the match will appear on Monday. RFSC have organised enough coach travel to take up to 500 Reading fans up to Wigan for Sunday's vital play-off semi-final first leg. Assuming all available places are taken then half of the RFSC membership will be making the journey by supporters' club coach. Currently there are 200 places left to be booked. The Ticket Office is not currently able to take phone bookings but will be taking personal bookings. Volunteers will be in place at the stadium between 5pm and 7.30pm tonight (Thursday 10 May) to take personal bookings - either in the main ticket office or North Stand ticket windows. The cost for the journey is 15 pounds, with the coaches due to leave the Madejski Stadium at 8:45am on Sunday and the Mecca Bingo Hall on Station Hill at 9:00am. To book coach travel you will need to be a member of RFSC - please see the Supporters' club pages within this site for further details. Reading youngsters Alex Haddow and Chris Smith are set to leave the club during the close season after failing to break into the first team set-up. Both players were on trial with Kidderminster last week with the possibility of a move to the club. Haddow made just one appearance this season for the first team - coming of the bench with ten minutes to go in the 4-0 home victory over Brentford. Last season Haddow made one start in the league and came off the bench twice. Meanwhile, Chris Smith spent a loan spell at York earlier this season without a start and had no league appearances to his name at this stage in his career. Haddow seems most likely to secure a league future for himself with Exeter City and Southend United rumoured to be interested in a short term contract. Steve Mautone is confident of Reading victory over the two play-off semi final fixtures and thinks that Reading will go on to win promotion in the final at Cardiff. In his latest column, Mautone urges fans to get behind the team - the support could be the difference when Reading travel to Wigan on Sunday. Ticket sales for the two fixtures are going well with over 11,000 tickets already sold for next Wednesday's home leg. Reading have an extended allocated for the away leg at Wigan's JJB stadium, and have already sold approximately 2,000 of the tickets for the fixture. Reading have been made favourites to win the Second Division play-offs this season, after finishing third in the table - well above the other three sides battling for the third promotion spot. The Royals are 7-4 favourites, with Stoke second favourites. Meanwhile, Wigan are the outsiders of the four teams with Reading expected to win over the two legs. Tickets for both legs of the play-off fixtures against Wigan are selling fast despite being available to season ticket holders only at this stage. When the tickets go on general sale on Wednesday (for next Wednesday's home leg), and Thursday (for the away leg this Sunday) they are expected to sell out almost instantly. Ticket sales have already produced big queues outside the ticket office - and this looks to be repeated over the next two days. Prediction League: Have You Won? Dave Evans, Squelchy Royal, and Gemma Bowcock. Richard Markham and George Town. Thank you to everyone that took part this season. Hob Nob Anyone? is an entirely non-profit making site dedicated to supporting the Royals. Any money made from the banner adverts on the site are used to pay for the resources this site uses, and for prizes such as those won on the Prediction League, which directly benefit the club financially. Thank you to all regular readers and contributors that have continued to help build the success of this site since 1994. Martin Butler has been voted official player of the season, and was presented with his award before Saturday's 3-3 draw with Bournemouth at the Madejski Stadium. Butler won the award ahead of runner-up Phil Parkinson. Jamie Cureton and Phil Whitehead finished third and fourth. If you weren't able to vote in the official awards then don't worry - you can still vote on-line. Make sure you vote in the Hob Nob Anyone? fans' end of season awards where you can vote for your player of the season. The awards also contain categories for the best improvement over the season and you can vote for the best and worst Reading performances throughout the campaign. Voting is open until Wednesday - and nearly 1,000 fans have already voted in the awards. Reading ended the league programme with a 3-3 draw in front of a record Madejski Stadium crowd this afternoon. A new stadium record of 20,589 saw the Royals come from 1-3 down at half time to draw 3-3 and end Bournemouth's play-off hopes. With three minutes to go the Royals trailed 2-3 and Bournemouth looked set to steal sixth place in the table. If the score line had stayed the same Bournemouth would have gone on to meet the Royals in the play-offs - but Nicky Forster grabbed a dramatic late equaliser after coming off the bench. The goal means that Reading will now go on to meet Wigan in the play-offs, who could only draw at home. Tickets for the second leg of the play-off, at the Madejski Stadium, went on sale after the match to season ticket holders. The massive queues around the ground prove there is a massive demand for tickets and the game looks set to sell out, and set a new attendance record, as soon as tickets go on general sale later in the week. Chris Casper is set to sue Richard Carpenter, the player responsible for the foul that resulted in a broken left leg for Casper on Boxing Day December 1999. Casper was stretchered off during Reading's 0-1 defeat at Cardiff City and has only recently returned to training after a 16 month lay off. Carpenter, now at Brighton, picked up a yellow card for his troubles but otherwise has escaped punishment. Casper will claim that the challenge has set back his career, and is taking the action with the worry that he may not return to the same standard of football that saw the Royals pay out 300,000 pounds in November 1998. Meanwhile, Casper will be working hard during the pre-season to try and claim a first team place in the side as Reading kick off the 2001/2002 season in August. Saturday's game against Bournemouth will go down in history as the first game to ever sell out at the Madejski Stadium. All tickets have now been sold for the fixture, as the club expect near a full house for the first time since the stadium was built. The game makes no difference to Reading's final league standing, with the Royals destined to finish third and seeking promotion through the play-offs. Bournemouth on the other hand need victory for a chance of breaking into the play-off positions on the last day of the normal league season. The Cherries have sold out their allocation for the South Stand, and have plenty of reason to create a bit of an atmosphere as they look for a vital league victory that could see them return to the Madejski Stadium in the play-offs. With an expected attendance of between 21,000 and 23,000, the club are advising that car parking is expected to fill very early and that extra buses have been laid on between the stadium and the town centre. Meanwhile tickets for the home leg of the play-offs on Wednesday 16th May will go on sale to season ticket holders from Saturday. Tickets for the away leg, to be played on Saturday 13th May, will go on sale to season ticket holders from next Tuesday - once the opposition is known! On-loan central defender Adrian Whitbread looks set to stay at Reading through the play-offs as Reading continue their hunt for promotion to Division One. Whitbread's loan spell is due to come to an end after Saturday's final scheduled league match against Bournemouth at the Madejski Stadium. Reading will be looking to sign Whitbread, who has been outstanding since arriving on loan from Portsmouth in February on a full contract. However the Royals will first need to increase his loan spell to cover the three potential play-off fixtures. The loan extension looks certain to go ahead with Whitbread keen to stay at the club - Saturday's game will see Whitbread's 19th appearance in the blue and white hoops. After Saturday's results Reading are certain to finish third in the table and will face the team that finishes sixth in the two-legged first round of the Play-Offs. Reading could play a big part in determining who our opposition will be with Bournemouth visiting the Madejski Stadium next Saturday. Bournemouth are on the edge of the play-off places and could move into sixth place in the table if they beat the Royals and either Stoke City or Wigan slip up their final games. Stoke are at home to Swindon and Wigan are at home to Bristol City in their final matches next week. Walsall seem certain of a play off place and are likely to finish fourth behind Reading - needing just a single point from their final two matches. It's not clear who we'll end up meeting - it could be any one of Walsall, Stoke, Wigan or Bournemouth. The play-off dates are also be confirmed, but Reading will travel away in the first leg which is likely to take place on Sunday 13 May. The return leg, at the Madejski Stadium, should take place on Wednesday 16 May. If Reading win over the two legs then they travel to the Millennium Stadium in Cardiff for the play-off final, taking place on Sunday 27 May. Reading missed out on automatic promotion today after a 2-1 defeat at Colchester United. The Royals will now finish third in the table and will have to settle for a place in the play-offs as the hunt for promotion continues. Rotherham were victorious once more with a typical last minute goal to beat Brentford - the result means Reading can't close the gap, and next Saturday's game against Bournemouth will make no difference to Reading's final position. The day may have ended in depression for the travelling fans but we were all in heaven early in the match after news filtered through that Rotherham were a goal down in their game. It all looked even better a few minutes later when Jamie Cureton scored his thirtieth goal of the season after a Sammy Igoe cross wasn't cleared. Reading looked on course for automatic promotion until Colchester equalised with a header from a cross from the left, and then took the lead from a mysterious penalty with a few minutes of the first half remaining. Reading failed to put enough pressure on in the second half, despite good saves from the Colchester keeper and some penalty appeals being turned down, and will now have to prepare themselves for the play-offs. Reading's automatic promotion hopes took another serious blow tonight as Rotherham were victorious at Luton Town. Rotherham ran out 1-0 winners, with another late goal, to move above Reading into second place in the Second Division table. The top three teams all have two games remaining - Millwall are five points clear of Reading, and Rotherham move two points clear. Rotherham's win means that if they win again on Saturday, and Reading fail to beat Colchester United, then Reading will have to settle for the play-offs this season. Realistically the Royals have to win on Saturday now to keep the automatic promotion dream alive. Reading's final match of the season - at home against Bournemouth on Saturday 5 May, at the Madejski Stadium, could be close to a sell out. The game could be the one that determines Reading's automatic promotion bid for this season. A victory at Colchester United on Saturday will keep Reading pressing hard for second place in the table and could push the attendance even higher. The East Stand is already sold out for the fixture, and there are limited numbers of tickets available for the Lower West stand. By next week it is expected that only North Stand tickets, and Upper West Stand tickets, will be available for the game. Bournemouth are also expected to bring a good few thousand of travelling fans which could see a new record attendance set for the Madejski Stadium. The biggest previous attendance was set on 27 March 1999 when 20,055 fans turned up to watch Reading lose 1-3 to Manchester City. Keith Scott scored Reading's only goal of the game on that day. Who Has Been Your Best Performer? Every season we ask Hob Nob Anyone? readers to vote in the end of season awards. Previous winners of player of the season include Phil Parkinson and Darren Caskey. Last year Scott Howie was voted as Reading's most improved player of the season - for the second season in a row. Scott Howie seems unlikely to make it three years in a row as his opportunities to play have been limited. Who do you think has been Reading's best performer, and which game was your best of the season? Make sure you cast your votes in the end of season awards between now and the end of the season. Rotherham stole the advantage in the race for automatic promotion yesterday as the Royals could only draw at home to Walsall. Rotherham are now just a point behind the Royals, but with a game in hand after their 2-0 win at Wigan. Reading have to win their last two games and hope Rotherham drop some points in their last three games if we're to grab automatic promotion. The day started brightly for the Royals with a good start against Walsall in front of nearly the biggest Madejski Stadium crowd of the season. 16,710 fans saw Jamie Cureton put Reading ahead after just 15 minutes. Jones did well to lay the ball to the right to Igoe who crossed for Cureton to stick it home. Reading started to control the game and deservedly went 2-0 up before the half hour when Butler played the ball through to Cureton to score. A lack of concentration saw Walsall pull one straight back, and Reading seemed to lose their confidence. At half time it seemed likely Reading would go on to win, but a Barras goal after a free kick eight minutes into the second half made it 2-2. Reading then failed to break down a strong Walsall defence and had to settle for just the point. It's going to be a nervous end to the season. Reading Reserves lost in the Avon Insurance Cup Final in a penalty shootout at Norwich last night, after drawing the match 1-1. A strong Reading team, which included Caskey, Hunter, Harper and Hodges, went behind in the first half after Norwich's Brian McGovern headed in from a corner. Royals equalised on 88 minutes, again from a corner, taken by Caskey and converted by the head of Chris Casper. Royals hit the woodwork on two occasions but could not find the winner. In the resulting penalty shootout Reading scored their first three before Nicky Shorey saw his spot kick saved by Canaries keeper Danny Gay. Nedergaard converted past Howie to give Norwich a 5-3 win. Speaking in his latest column, exclusive to Hob Nob Anyone?, Steve Mautone talks about the tremendous support the team are getting in the promotion push. Reading's crowds have been steadily increasing as the Royals get closer and closer to securing automatic promotion to Division One. Last night's victory at Oxford United was sold out for Reading fans well before the night - even resulting in touts trying to buy and sell spare tickets outside the ground! Reading's final away game at Colchester United is already sold out and the final two matches of the season at the Madejski Stadium look set to be the two largest home gates of the term. Reading kept on track for automatic promotion last night with a 2-0 victory over Oxford United at the Manor Ground. A packed away end saw a poor performance from the home side as they failed to contain the unstoppable strike force of Cureton and Butler. Reading took the lead after Igoe threaded the ball through into the box, Butler dummied and Cureton stuck it home on twenty minutes. Oxford got much more into the game towards the end of the first half but failed to seriously trouble Whitehead in the Reading goal, hoofing the ball all over the place - but not on target. Butler wrapped up the points, scoring from the left side of the area, with twenty minutes to go to give the Royals a deserved victory. Reading remain five points behind Millwall in second place after the London side managed a 5-1 victory at Cambridge. Reading took another huge step towards automatic promotion this afternoon with a convincing home win over Bury. The 4-1 victory moved second placed Reading three points clear of Rotherham who could only draw at Swansea City. With just four games left to play until the end of the season Reading now look favourites to join Millwall in automatic promotion to Division One. Millwall kept up their lead at the top of the table with a 1-0 home victory over Swindon. It was Bury who got off to the best start in front of the Madejski's biggest crowd of the season, 16,829, scoring after just 8 minutes. However the away side's joy was short lived with Igoe smashing home a great shot from way outside the area into the roof of the net just three minutes later. Cureton lobbed the ball into the net after 23 minutes to give Reading the lead at half time. Bury were reduced to ten men in the second half after an off the ball incident involving Phil Parkinson, and Reading began to dominate the game. Parkinson set up Butler to make it 3-1 ten minutes into the half, and Butler got his second seven minutes later - sticking home an Igoe cross from the right. Caskey could have made it five with a free kick that hit the crossbar, but the game was already well won. Cherries Beaten - Royals Go Second! Determination and dogged defending saw Reading through tonight as they overcame a good Bournemouth side 2-1 to leapfrog Rotherham into second place in division 2. In a frantic opening ten minutes, Jermaine Defoe took advantage of a poor Igoe backpass to put Bournemouth ahead. Cureton scored immediately after the resulting kickoff to level the scores, before supplying Butler just five minutes later to give Royals the lead. Cherries roared back to find an equalizer but found Phil Whitehead in terrific form - the former Oxford keeper saved a penalty on 17 minutes and a flurry of brilliant saves combined with the kind of luck which saw Bournemouth hit the woodwork four times without success saw Royals through. Rotherham have a game in hand after tonight, but four of their six remaining games are away, so a Royals win against Bury on Saturday would give us a great chance of cementing second place and automatic promotion. Second place in division 2 is the prize tonight if Royals can overcome an in-form Bournemouth side at Dean Court. Neither Rotherham nor Millwall play this evening, so three points are vital as Reading use up their game in hand over the Lions. Reading's last win at Dean Court was just over two years ago, when Mark McKeever scored the winner in a 1-0 victory. Phil Whitehead is doubtful with a sore ankle after a challenge from Marcus Richardson at Cambridge on Saturday, so Scott Howie may step in. James Harper (tonisilitis) and Graeme Murty (hamstring) are also sidelined - Ricky Newman will probably come in at right back while Harper's place will go to either Caskey or Jones. Ex-Royals keeper Steve Mautone wonders whether the two away draws against Luton and Cambridge may represent crucial lost points as the promotion race enters the home straight. In his his exclusive HNA column, Mauts reveals the thoughts of captain Phil Parkinson and claims the team need to settle their nerves and get back to passing their way to victory. The sending off of Matt Robinson for two bookable offences turned Saturday's game at the Abbey Stadium. Reading dominated the first half in the usual atrocious conditions and Royals went ahead when United keeper Andy Marshall dithered over a backpass and allowed Jamie Cureton to slot the ball home. Cambridge fought back in the second half, spurred on when Matt Robinson saw red for two bookings (the first for wasting time at a throw in when his throw was being impeded). The U's threw everything forward for the inevitable equalizer which came on 83 minutes from the head of Paul Wanless. Considering the circumstances, it's possible to see this as a point gained, and with Millwall thrashing Rotherham at the New Den, there's still everything to play for. As they say. The FA found Jamie Cureton guilty of misconduct this afternoon for his 'over-zealous' celebration against Bristol Rovers in January. However no punishment was handed out to the ex-Rovers striker due to mitigating circumstances - namely the constant insults he has endured from bitter Rovers fans since his move last August. Reading came away with just a point from last night's visit to Luton Town after a disappointing second half where the Royals failed to break the home team down. Both sides contributed to a lively first half with Butler catching the keeper way off his line to put Reading ahead after just five minutes. Reading's lead didn't last long though with Harper connecting with a cross from the Luton left to head home an own goal. Both sides had chances during the first half to take the lead, but Luton defended well in the second half and Reading left with just the single point. Meanwhile Millwall went back to the top of the Division with a home win over Stoke City. Reading will be looking for another win at Luton Town on Tuesday night - which could put the Royals second in the table. Meanwhile Millwall face a tough home game against Stoke City. If Millwall fail to win while the Royals collect three points, then Reading will move into the automatic promotion positions. The game is all ticket for Reading fans, and there are still some tickets remaining for what will be another vital match for the Royals. Luton Town will welcome back striker Mark Stein who has been out with an ankle injury, meanwhile Pardew will probably stick with Cureton and Butler up front and have Forster available on the bench. Viveash is still struggling with a knee injury after limping off on Saturday, but is expected to start again. Steve Mautone believes Reading's recent run of form speaks for itself as the Royals won two on the trot following our only defeat from fourteen league matches. Mautone heaps praise on Reading captain Phil Parkinson in his latest column and thinks we're on for four points from our next two away outings, as the promotion chase continues.